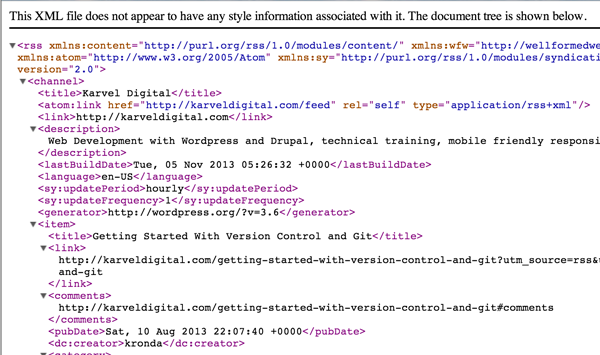 This has come up a few times in the last few months, so it’s high time to get some clarity around ‘subscriptions’ vs ‘feeds’ in WordPress. Most often when I get this question, someone has clicked on a button with the classic RSS icon and, instead of being invited to subscribe, they get an ugly page full of XML. RSS feeds supply new content on your site and any service equipped to read that feed will be updated when new content is posted. However, if the browser you happen to be using hasn’t been configured to deal with feeds in some logical way, then it will simply display the raw information. Yuck. Who wants to read that? The Internet is not new, and most people who use RSS have figured out some system for subscribing to their feeds. 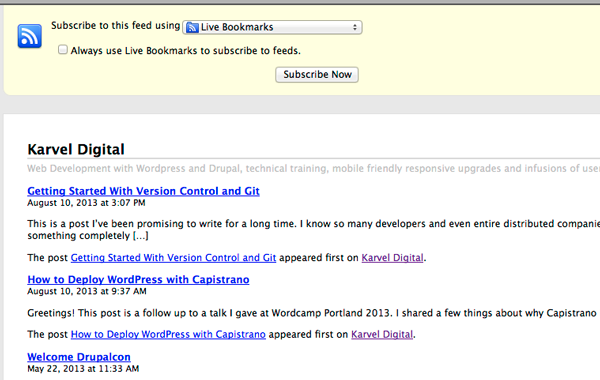 They might even, as part of that setup, get regular email notifications about new feeds. However, that does not make RSS an email subscription. If you’d like to notify readers of new content, but you’re worried about possibly confusing them with a bunch of unexpected XML, then you can offer them the option to subscribe to your posts via email. The option for readers to subscribe to your posts via email does not exist automatically with a core WordPress install but don’t despair. There are many fairly easy ways to achieve your goal. Feedburner is a free service from Google that many people use to serve their blog feeds. 1. You CAN use feedburner to turn your RSS icon into an email subscription link. Here’s a post that shows how to do that. 3. Feedburner offers analytics about your subscribers, click-through rates and lots of other things. 2. Google has been known to shut down popular services before. You’re not paying for the service, so you’re pretty much at their mercy. Jetpack brings a bunch of supercharged functionality that was previously only available to WordPress.com users, and makes it available for your self-hosted WordPress site, including email subscriptions. 3. Connect Jetpack to your WordPress.com account (A giant reminder banner will appear at the top of your admin area until you to do this). 1. In the Settings > Discussion area of the admin, you will now see new options at the bottom of the page to add a ‘Follow Blog’ and/or ‘Follow Comments’ checkbox to your comment forms. 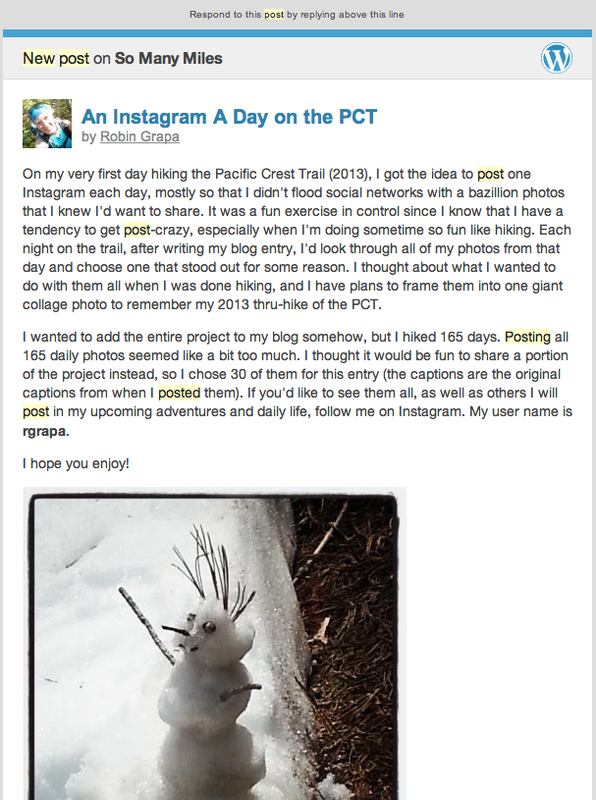 Readers can choose to follow your entire blog, or a particular comment thread. 2. In the Appearance > Widgets section of your admin, you will now have a ‘Blog Subscriptions (Jetpack)’ Widget, which you can use in any of your widget areas such as the sidebar or the footer. If you’re using MailChimp, AWeber or a similar service to manage and build an email list, there’s most likely a plugin which will allow you to add a subscription form that subscribes readers to your email list instead of your blog posts. The MailChimp plugin is pretty robust and AWeber has lots of options in the plugin repository. Once you choose and plugin and install it, you’ll go through a similar process to connect to your provider account, and then have Widgets available to use throughout your site. RSS = a feed of information. How people partake of that feed is up to them unless you use feedburner or some other means to offer email subscriptions. Jetpack = email readers the content of new blog posts or comments automatically. MailChimp = add a form to your site for people to sign up for your email list. This will NOT send them automatic blog posts, unless it’s your habit to email your list every time you post something new on your site. It’s up to you to decide which method or combination of methods best help you reach your goals. Thank! You laid out everything nicely. 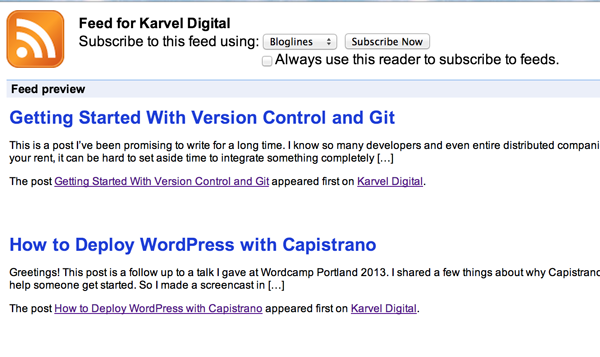 I really appreciated how you separated and described Feeds vs Subscription vs Newsletter. Great Job.